The Indiana Mustangs will kicked off its 22nd season on July 14, as they downed the Lake County Steelers 55-0 at Marian University. This was the opening regular season game for both teams as members of the Mid States Football League. The league includes eighteen teams from Indiana, Illinois and Wisconsin. Each MSFL team will play an eight-game regular season schedule culminating with an eight-team playoff beginning September 15, 2012. The Mustangs – founded in Kokomo – are the oldest and most successful adult amateur football team in Indiana, and this year’s team is loaded with several former college players coming ironically from two rival colleges – University of St. Francis and Marian University. The Mustangs are led by standout quarterback Eric Hooks, a former University of St. Francis and North Central High School player. The Carter brothers were raised on Mustang football, watching their father, Paul Carter Sr., become one of the most prolific running backs in semi-pro football from 1991-2001. His powerful running style dominated the Mid-Continental Football League, where he still holds five rushing records including a season high 1,997 rushing yards and two 300-yard games in 1996. The senior Carter was also named MVP of the league three times during his career, and in 2004, he was inducted into the American Football Association’s Hall of Fame located in Canton, Ohio. His legacy will continue with his sons playing for the Mustangs this year. Carter Jr. (Northwest HS) is the team’s most versatile athlete, and he will help lock down the secondary. Junior will also likely see action at receiver, quarterback and punt returner. This marks his third season with the Mustangs, and he already holds the team’s single-game interception record with three interceptions against the Detroit Seminoles in the 2009 playoffs. Carter Jr. also holds the individual game, season and career interception records at USF while younger brother Daniel is the all-time scorer and leading rusher at USF. Daniel was also an Indiana North-South High School All-Star who played at Decatur Central HS. This will be Daniel’s first season with the Mustangs, and both brothers are hoping to lead the team back to the greatness of the 1990’s. Former teammates at Decatur Central, offensive linemen Tony Hamble and Josh Cox (Evansville Rage) look forward to blocking for Carter again along with Kentucky State standout Robert Battle, who blocked for Paul, Jr. at Northwest HS. The Mustangs receiving corps is probably the most talented in team history and are led by three former Marian Crusaders who were part of last year’s No. 1-ranked team that won the MSFA title and were NAIA national runners-up: Jeff McClure (Brownsburg HS), Julian “Juice” Williams and JaQuan Pattilla. During their college careers, all three players received several honors. Gavin Wisel from Trine University, Luke Floyd (Ritter HS) from Franklin University and former IU receiver Brandon Walker Roby (North Central) will provide depth, experience and speed at wideout. Defensively, the Mustangs are led by former junior college player Sean Harris (North Central), former NFL Europe player Mathias Whitaker and long-time Arena Football players Mike Cupp (Danville) and Dontae Hart (Ben Davis). The Mustangs also added two former All-MSFA performers from Marian – linebacker William Stubbs (Cathedral HS) and defensive end Dontae Crooks (Arsenal Tech HS). The Mustangs are always looking for quality college players, dedicated volunteers and corporate sponsors. Advertising opportunities are available ranging from $50 – $2,500. Future home games will be played at Marian. with kickoff scheduled for 7 p.m. unless otherwise noted on the schedule (see page 5). Tickets are $8 for adults, $5 for students/seniors and children under 6 and military personnel are FREE (must have military identification). 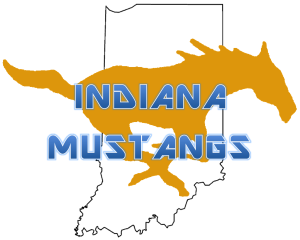 For more information on the Indiana Mustangs, please contact either Rich Castanias (317-908-8399) or Garrett Doan (317-698-2074). I just wanted to ask where this team is at in Indiana? Im from Richmond IN but I moved to florida 2 years ago and have been playing semi pro football down here and I plan on moving back up to Richmond and I still want to play football if you could get ahold of me that would be wonderful thank you…. I would like to know about the possibility of playing. When are tryouts? Im 6ft 2 weigh 220 I’m a defensive End I would like to tryout for your team. Please e-mail me back. I would like to play for you guys. How can I get info on tryouts, practices, etc. My name is Joe, 30 years old, 5’5, 160 lbs and my dream is to become a pro athlete in sports. can i be recruited? I am willing to put the work in. Is there still a team? I’ve played 14 years of tailback and quarterback.